Giving & Greed Mystery Box Giveaway Winner: Congratulations to Brandon B. of Greenvill, SC, winner of the Giving & Greed Mystery Box. Thanks to all entrants, and be sure to check the Dude homepage or Dude Giveaways section for your chance to enter our latest prize drawing. This giveaway concluded on December 9, 2018. Some for you, some for me. Not necessarily equal parts since I usually prefer the scales tipped towards me, but enter to win Dude's Giving & Greed Mystery Box, and I promise it will be all about you this time. Take care of your holiday shopping and holiday self-indulgence with $300+ of spoils selected and delivered to your door for 0% effort on your part. 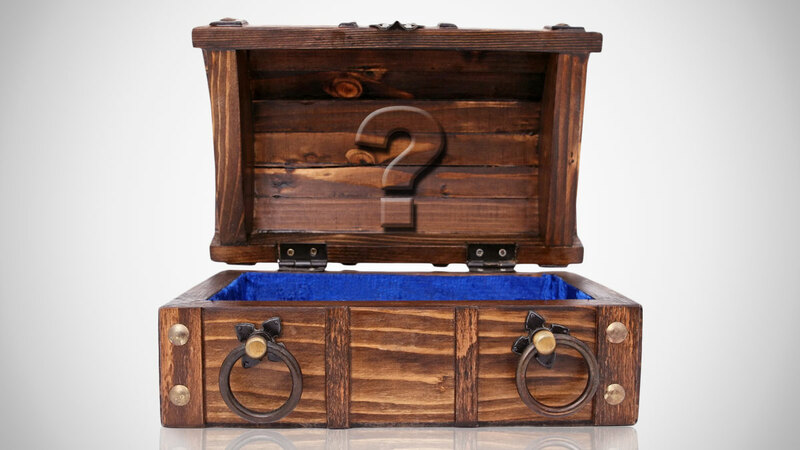 We can't tell you what's inside, but we can tell you this Mystery Box is stocked with Dudeworthy products specifically chosen to serve as the perfect holiday gift for that someone special in your life. Even if that someone special is you. We can also tell you the total prize retail value is over $300. To register, click here and fill out The Giving & Greed Mystery Box Giveaway entry form. Or, if you're already a member of DudeIWantThat.com, when the magic entry form button appears, just click it to enter. Giveaway prize includes $300+ worth of products, most of which have previously been featured on DudeIWantThat.com. Winner should allow up to 2 weeks for mystery box delivery, but it will probably be there by Christmas. Probably.